The Townsend Casual Sofa Sectional Group by Rowe at AHFA in the area. Product availability may vary. Contact us for the most current availability on this product. Padding & Ergonomics FeatherSoft cushions...a modern and balanced blend of down, feather and fiber, channel quilted in a down-proof jacket that surrounds a high-density foam core...a cushion with rich, sink-in comfort and the look and feel of classic down cushions. 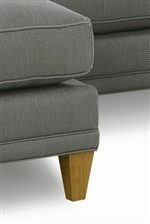 The Townsend collection is a great option if you are looking for Contemporary furniture in the area. Browse other items in the Townsend collection from AHFA in the area.